In 1986 – the year of the Chernobyl nuclear disaster – Ukraine experienced massive internal migration. The authorities evacuated around 90,800 people from an irradiated area of some 30 square kilometres. Tens of thousands fled even further away from the site of the explosion – to southern Ukraine or other republics of the USSR. Those affected by the accident at the reactor, as well as the clean-up workers and relatives of the victims received special status and various privileges from the state. Now Ukraine is again faced with a flood of IDPs (internally displaced persons). But what are the authorities doing? According to the UNHCR (UN Refugee Agency), there are 117,000 IDPs in Ukraine. Among them 101,800 are from the war-torn Donetsk and Luhansk regions, and 15,200 from Crimea (of 2.3m inhabitants of the Russian-occupied peninsula). These figures are estimates, given that there is no unified system of registration for IDPs. Their actual number may be much higher. Officials from the Ministry of Social Policy of Ukraine register only those who appeal to them for help, as do regional administrations and civic activists. The UN collects data from all sources and analyses them in order to assess the scale of the problem. 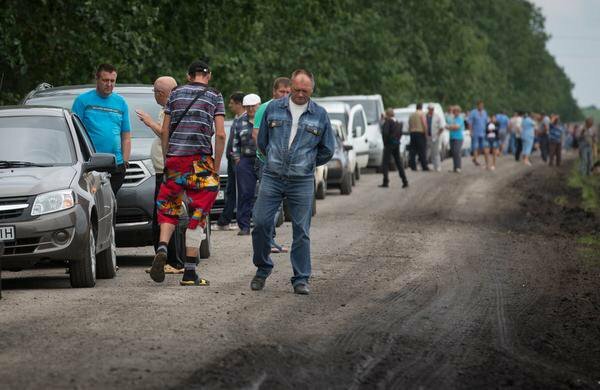 IDPs from the Donetsk region wait at a check point. (c) Demotix/Inna Sokolovska. Human Rights Watch states that its representatives spent nine days in June 2014 among displaced people in Kyiv, Vinnytsia, Kharkiv and Lviv regions, the majority of whom declared that they had not received help of any kind from the government. The authorities stood idle while citizens fled for their lives, seeking shelter, food or clothes. Displaced people were often unable to receive medical or social services in other regions of the country. Those with whom I was able to speak described the same problems. The authorities stood idle while citizens fled for their lives, seeking shelter, food or clothes. Nevertheless, some displaced people are receiving assistance from the government or local authorities. Anatoly Zasoba,leader of the Crimean Diaspora organisation (which has around 150 members) says that of the 3,500 displaced people from Crimea, the authorities have resettled only 650 in the Ukrainian capital of Kyiv – meaning that only 20% received assistance from officials. The rest count on their own strength or make use of help offered by community activists or charitable foundations. Zasoba left the Crimean city of Sevastopol himself after receiving personal threats. He opposed the Russian occupation, and stood up for his hometown’s Ukrainian status. Zasoba was born in Sevastopol and lived there for 28 years, doing business in the city until he was forced to flee in 2014. In Kyiv he received assistance from friends, but not from the state. The example of Sevastopol journalist Tatyana Rikhtun is also very revealing. She worked as a journalist and tried to objectively cover the situation in Crimea; this displeased the pro-Russia paramilitary organisations, which supported the government in the peninsula in February-March 2014. Following a series of attacks and threats Rikhtun was forced to flee to Kyiv. ‘the Internews Network organisation hired professional security for me and practically evacuated me (from Crimea)’ said Rikhtun, ‘they initially rented accommodation for me. The Polish-Ukrainian friendship foundation also helped me, as did the Bratislava hotel. I’ve now found work, and rent an apartment at my own expense.’ Rikhtun also received no assistance from the state. Some displaced people have however been guaranteed accommodation in dormitories and sanatoria, which are not as a rule in the best condition and are also located on the outskirts of cities (there are around 40 such buildings in Kyiv). The authorities have not yet determined a clear set of terms for temporary accommodation, which is now leading to conflicts. Red Cross volunteers and ordinary citizens provide food and other essentials to the displaced people – who as a result are not interested in finding a job. Displaced people with diverse political views live under the same roof, which also leads to conflict. Among the new inhabitants of the 'Crane' sanatorium, for example, are those of both pro-Russian and pro-Ukrainian views. It is possible that the former would have wanted to emigrate to Russia, but were unable to. Crooks and swindlers are already using the displaced people for their own interests. A certain Gayde Rizaeva collected money from several well-known organisations, supposedly in support of displaced people. It later became known that she had cheated them. Another case is connected with the seizure of private property under the guise of assisting displaced people. On June 23, Igor Myroshnychenko and Eduard Leonov – deputies of the Ukrainian Parliament from the far-right Svoboda party – tried to take over several apartments in a high-rise building at 118 Zhylyanskaya Street in central Kyiv. Together with 30 to 40 ‘refugees’ (real identities unknown), they took over apartments on the 30th and 32nd floors of the building. The police did not dare to stop them. The Ukrainian internet newspaper Obozrevatel notes that the deputies’ activities were recorded by the Russia 24 news channel – a mouthpiece of Kremlin propaganda. On Monday 21 June, Volodymyr Groysman, Deputy Prime Minister of Ukraine and Minister of Regional Development, declared the imminent creation of a single civil service department to specially address the issue of IDPs in Ukraine. Groysman is extremely influential and is seen as close to President Petro Poroshenko. Before assuming his role in government, Groysman was mayor of Vinnytsia, a city in central Ukraine. Vinnytsia is also the location of a factory of Poroshenko’s Roshen confectionery company; and where the current President has consistently won a majority of votes in parliamentary elections since 1998. One of Groysman’s innovations is a site allowing users to search for accommodation for displaced people. Many residents of Crimea are Ukrainian citizens who are deprived of their savings due to the occupation. Yet another problem for displaced people, which the authorities seem in no hurry to resolve is that of blocked bank accounts. Many residents of Crimea are Ukrainian citizens who are deprived of their savings due to the occupation. In particular, the state Oschadbank and private Privatbank (owned by Ihor Kolomoyskyi, Governor of the Dnipropetrovsk Region) will not return money to displaced people. Employees of Privatbank’s hotline apparently snapped at refugees from Crimea to ‘return to Russia to withdraw money.’ The Crimean Diaspora organisation announced a picket against the National Bank of Ukraine on Friday 25 July to demand the return of deposits. Ukrainian officials are also not helping citizens who remain in the occupied territories. In the press, the Ministry of Social Policy of Ukraine speaks of social welfare payments for such citizens in Crimea, being distributed from the neighbouring Kherson Region. However, these same citizens dispute such reports. Sevastopol resident Yelena Sokolan – a Ukrainian passport holder – says that the Ministry refuses to pay social welfare for her child, as mandated by law. The Ukrainian pension fund also promises to transfer money to occupied Crimea by postal order. However, pensioners or their authorised representatives have to first travel to Kherson Region (which borders occupied Crimea) and present a certificate confirming that they refuse a Russian pension. Where such certificates can be obtained is one question. How a pensioner of poor health is expected to make the journey to Kherson Region is another. The Ministry has so far answered neither. People who have fled Crimea and eastern Ukraine to other regions of the country are faced with the problem that there is no legal status for IDPs in Ukrainian legislation, nor mechanisms for receiving them. There is no legal status for IDPs in Ukrainian legislation. Journalists and members of the public regularly use the word ‘refugee’ in relation to internally displaced people. Legally, they cannot be described as such, as they are Ukrainian citizens; refugee status can only be received by foreigners or stateless people; and the process is not automatic. In order to receive a refugee certificate, the applicant must go through a special procedure at the State Migration Service of Ukraine. Accordingly, people who left Crimea and eastern Ukraine seeking refuge do not even have the right to demand that the government provide them with the temporary accommodation and social services afforded to refugees. The mechanisms for dealing with these problems have not been developed – from the legal definition of their status to issuing a certificate to IDPs. Essentially, the state treats these people as ordinary citizens of Ukraine. Refugee children from the eastern part of Ukraine pictured playing in their room in a camp in Pushcha-Vodytsya near Kyiv. Perhaps that is for the best: after the disaster at Chernobyl in 1986, around 47,500 people received special certificates and benefits. Among them were many scammers who bought themselves the status from corrupt government officials. The coordinator of the Crimea SOS project (an organisation of ten people and executive partner of UNHCR) Tamila Tashieva, also opposes a special status for IDPs. She believes that a special status interferes with their ability to adapt to their new lives. Tamila’s organisation has found accommodation in private apartments and houses for 700 displaced people from Crimea and eastern Ukraine. Tamila believes that they should under no circumstances be housed in dormitories and sanatoriums, as they then lose ties with society. Though they may not afford them any special status, government officials have made some steps towards helping displaced people. For example, in order to register a new place of residence, Crimeans are not obliged to de-register beforehand in occupied Crimea. Students from Crimea can transfer to other universities. Deadlines for the submission of school graduation tests for former residents of Crimea have been extended. University application rules for displaced applicants from Crimea have also been simplified. The Ukrainian government has also set aside 25m hryvnia (about £1.25m) for temporary accommodation for displaced people. Yet it is not the displaced people who will receive this money, but the landlords and owners of hotels and sanatoria – and according to very opaque rules; a deal ripe for corruption. It is not the displaced people who will receive this money, but the landlords and owners of hotels and sanatoria. ‘IDPs are amazed at their lack of rights compared to those enjoyed by refugees,’ says lawyer Lyudmila Zlobina, a former employee of the Kyiv Region section of the State Migration Service of Ukraine. ‘Many displaced people left employment in their former places of residence, and now suffer as they are not doing anything. In contrast to officially recognised refugees, the state is not obliged to provide them with work’ says the lawyer. Displaced people, just like any other citizen, instead have the right to access a job exchange (for aid from the state in finding employment). Deputies of the Verkhovna Rada (Parliament) of Ukraine adopted two laws concerning immigrants. The first – concerning residence on the temporarily occupied territory – mentions only the conditions of entry and exit to Russian-occupied Crimea. The second law – on the legal status of displaced people – was rejected by President Petro Poroshenko at the request of a number of civic organisations. NGO activists believe that the document did not establish real mechanisms to assist displaced people. The Cabinet of Ministers of Ukraine, which is not directly accountable to the President, received very broad powers’ and the law was passed without public debate, in violation of the regulations of the Verkhovna Rada. However, the law did contain a mechanism for adopting the status of IDP. As mentioned above, the introduction of such a status for the provision of social welfare to displaced people can be abused to corrupt ends. It is important not to forget that such a decision could also be used to further populist goals, as Ukraine will hold early parliamentary elections in autumn 2014. Deputies are ready to promise anything and everything in order to win an election – even if the state’s coffers are empty. Image three: (c) Demotix/Danil Prikhodko.